Dickies Tactical Soft Shell Jacket FREE SHIPPING! Dickies Tactical Soft Shell Jacket is the accessory you need for both warmth and convenience. 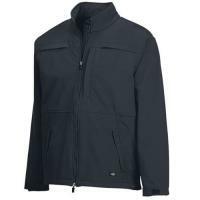 Dickies uses a blend of 92% polyester and 8% spandex for the 9.8 oz shell and 100% polyester for a 4.13 oz brushed tricot lining to create a warm, soft, flexible jacket with articulated elbows. This jacket includes ID panels that are hidden both front and back, as well as pockets for storage and front slash style for keeping your hands warm. Dickies Jacket even includes CCW access to your holster on the side. Choose your color between midnight blue or black and from a wide range of sizes to fit every figure. ©2002-2019 CopsPlus.com: Dickies Tactical Soft Shell Jacket FREE SHIPPING!